Andrew was the first named storm and only major hurricane of the otherwise quiet 1992 Atlantic hurricane season, but …. 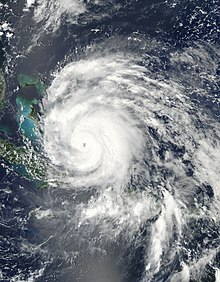 Hurricane Andrew was a long-lived, destructive, classical, and very powerful Cape Verde-type hurricane of the 1992 Atlantic hurricane season and was only the third Category 5 hurricane to make landfall in the United States, after the Labor Day Hurricane of 1935 and Hurricane Camille in 1969. Colorado State University meteorologists William Gray & Phil Klotzbach released the annual CSU Atlantic Hurricane predictions for their 2012 April report on 4/5/2012. They expect 2012’s June 1st to November 30th hurricane season to be less active. The scientists warn that “a slow season is no reason to breathe easy”, though. CSU scientists forecast 10 named storm, 4 hurricanes, and 2 major hurricanes (winds greater than 111 mph winds). In typical years, 11 named storms, six hurricanes and two major hurricanes hit the Atlantic, Caribbean and Gulf of Mexico. There is a “… high likelyhood that an El Niño effect will develop this summer”. El Niños (in the Pacific) create wind shear (strong winds at high altitudes) that makes it more difficult for tropical storms to grow into hurricanes. The CSU team predicts that there is a 42% chance that at least one major hurricane will make landfall on the U.S. coastline vs this last century’s average of 52%. The report marks the 29th year for the CSU hurricane forecasting team, which is led by Philip Klotzbach and William Gray, but this was the first time for their forecast to include the probabilities of key factors affecting the hurricane season, versus previous simple numerical forecasts for the number of storms. There is more reliable data available by April, so the CSU meterological group plans April forecasts, like this one, that identify the number of expected named storms, hurricanes and major hurricanes (Saffir/Simpson category 3-4-5). Additional updates of the 2012 Atlantic basin hurricane activity forecast are planned for June 1 and Aug. 3. • If there is no 2012 El Niño and the THC conditions continue at above-average conditions, (45% combined chance for this outcome), then hurricane activity will be approximately 40 percent higher than the average season. This translates to roughly 12-15 named storms, 7-9 hurricanes, and 3-4 major hurricanes. • If there is a significant El Niño and the THC continues in the same above-average condition that has occurred every year since 1995 (30 percent chance of occurring), then tropical cyclone (TC) activity should be reduced to approximately 75 percent of the average hurricane season: roughly 8-11 named storms, 3-5 hurricanes, and 1-2 major hurricanes. • If the THC becomes unusually strong in 2012 and no El Niño event occurs (15% combined chance), then TC activity increases by approximately 80 percent above the average hurricane season. This translates to roughly 14-17 named storms, 9-11 hurricanes, and 4-5 major hurricanes. • If the THC becomes weaker (growing to only 40% of its normal strength) and a significant El Niño develops (10% combined chance), then there would be approximately 5-7 named storms, 2-3 hurricanes, and 0-1 major hurricanes. As the annual weather cycles proceed to June and August, scientists then can identify the actual levels of the THC and El Niño events, and the CSU team will update their predictions. They accurately predicted 2011’s above-average hurricane activity for the Atlantic basin. In their June, 2011 forecast, the team called for 16 named storms, 9 hurricanes, and 5 major (Category 3-4-5) hurricanes. 2011’s events included 19 named storms, 7 hurricanes and three major hurricanes. We look forward to their upcoming June and August updates.